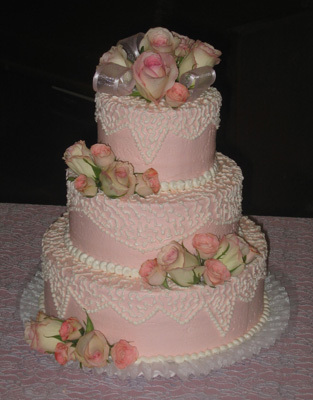 "Home of the Original Pink Champagne Cake"
"Serving The Valley Since 1989"
Here at the Victorian Cake Company we specialize in the creation of exquisite wedding and special occasion cakes, including birthdays, baby showers and graduations. We are a family owned business serving the Valley since 1989, and have become known for our beautiful wedding and birthday cakes, custom designed and completely iced and decorated by hand. With over 50 different cake flavors, fillings and frostings to choose from, we can create a cake to satisfy just about anybody's desire. Our signature cake - Pink Champagne with Strawberry Cream Cheese filling and Pink Buttercream frosting - is our most popular and a favorite among our customers. And for the chocolate lovers, we have our decadent Caramel Turtle cakes filled with pecans, chocolate chips and caramel. So if you are getting married or looking for that special cake for your upcoming celebration, you are welcome to schedule an appointment for a consultation to take a look at our beautiful wedding and birthday cake portfolios. Celebrating 25 years in business, the Victorian Cake Company has become well known throughout the Valley for their wedding, birthday and special occasion cakes. "Take 'em Home Today" Cakes - Fancy, Last Minute Cakes in 2 Hours!